As summer approaches, officials are warning that mosquito eradication efforts, lab tests and vaccine research may not be able to catch up. There are 346 cases of Zika confirmed in the continental United States — all in people who had recently traveled to Zika-prone countries, according to the most recent CDC report. Of those, 32 were in pregnant women, and seven were sexually transmitted. But in Puerto Rico, the Virgin Islands and American Samoa, the virus is now being transmitted locally. Of the 354 cases in the territories, only three are travel-related, and 37 involved pregnant women. Schuchat said the virus has been linked to a broader array of birth defects throughout a longer period of pregnancy, including premature birth and blindness in addition to the smaller brain size caused by microcephaly. 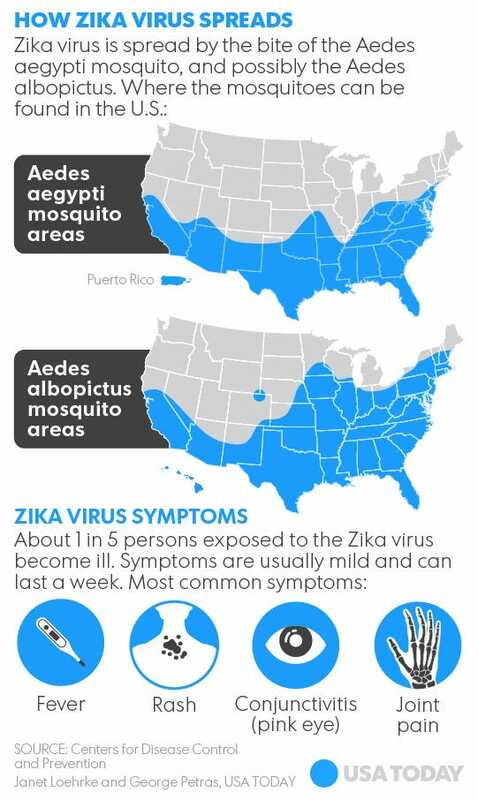 The potential geographic range of the mosquitoes transmitting the virus also reaches farther northward, with the Aedes aegypti species present in all or part of 30 states, not just 12. And it can be spread sexually, causing the CDC to update its guidance to couples. Doctors have known for years that Zika virus is associated with Guillain-Barre syndrome, in which the body attacks its own nerves, causing paralysis. But a study released Monday also links Zika to a second autoimmune disorder called acute disseminated encephalomyelitis. It resembles multiple sclerosis and involves a swelling of the brain and spinal cord. New studies also show that the Zika virus appears to hone in on brain cells and kill them.